When I first opened ‘Seeing Butterflies’ I was so enthralled by the superb photographs of butterflies and moths that I kept turning the pages treating the volume initially as a picture book, a visual experience further enhanced by the entire contents being printed on yellow, orange and green paper as opposed to the more traditional white. Then I started reading and if I had been enchanted by the wonderful illustrations, I rapidly became even more captivated by the text. Philip Howse has the ability to express his ‘New Perspectives on Colour, Patterns and Mimicry’ in a fluid, eloquent but straightforward manner making his theories immediately accessible to a very wide audience. This is a work that tries to persuade us to see something from another species point of view – insect eating predators such as birds, whose visual perception is very different from ours. Humans have a habit of assuming that what they see is the only reality but Professor Howse discusses many intriguing facts about eyesight and the world as a bird might view it. He cites various experiments carried out to further our understanding of how birds see things including the way they observe and respond to a single detail first rather than view the overall picture as we do. He explains how butterflies and moths have developed survival strategies using behaviour, camouflage and mimicry to take advantage of avian visual capabilities and so deter or evade predation. The author goes on to describe how butterfly and moth wings have evolved to feature all manner of images from big round eyes, teeth, claws, poisonous caterpillars and insects to animal and bird faces. Each eye-spot, set of stripes or dark dashes will be seen by the bird in isolation and could bear enough resemblance to the attributes of a particular creature to cause momentary hesitation and allow the butterfly or moth to escape. Philip Howse encourages the reader to study photographs in the book carefully, pointing out how to ‘find’ caterpillars for example along wing margins, twist and turn the picture to consider it from another angle then discover the head of a fox-like animal on an eyed hawk-moth or a hornet on the body and head of a death’s head hawk-moth. This was fun and I enthusiastically entered into the spirit of the activity but I soon began questioning the fact I was finding all these features within the capabilities of my own eyesight and imagination. What would a bird actually be seeing I asked myself? ‘Seeing Butterflies’ does contain a few photographs taken in near ultraviolet light and with the shorter light wavelengths enhanced that do attempt to show us, but more would have added fascinating proof to back up such refreshingly enlightening theories. However in all probability obtaining this kind of evidence requires prohibitively expensive equipment and printing techniques. 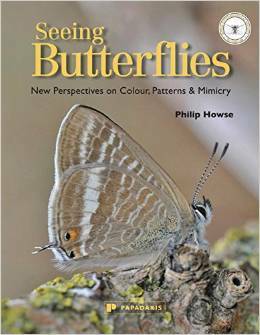 The latter section of the book has whole chapters dedicated to groups of butterflies like peacocks, tortoiseshells, whites and yellows as well as hawk-moths and giant silk moths, many commonly seen either in our gardens, the wider countryside or butterfly houses. Each is full of absorbing facts and details not found in popular butterfly and moth field guides, further serving to expand the author’s ideas with actual examples. This is a thought-provoking, perception challenging, exquisitely illustrated work that should appeal to anyone with even a passing interest in butterflies and moths.